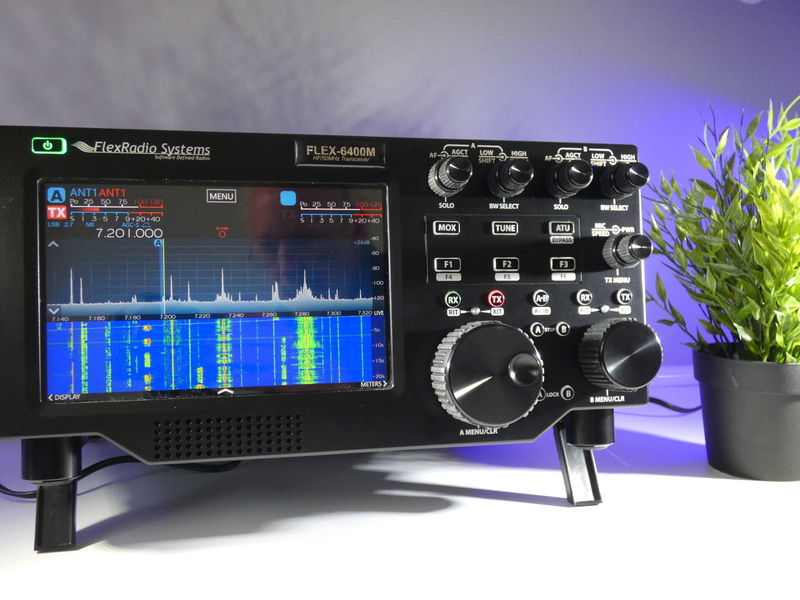 In the spring of 2017 Flex Radio announced an upgraded version of their 6000 line of SDR based transceivers. These models were labeled the 6400,6600,6400M, and the 6600M. In a nutshell, the 6400 series is an upgrade of the dual slice receiver 6300 and the 6600 is an upgrade of the four slice receiver 6500. The M series adds an 8 inch color touch screen display plus knobs and buttons for “no computer needed” operation. The chassis has gotten larger on the new 6000 series also. With exception of the size change and the builtin displays most of the changes are internal such as better filtering. The new 6000 series also come with the latest version SmartSDR which features an improved remote over internet component called SmartLink. Flex also managed to keep prices down on the new 6000 series. The 6400 starts at $1999 without the optional built in antenna tuner. This makes the 6400 very competitive with most midlevel 100 watt legacy transceivers currently on the market. This makes the 6400 a good solid choice for those who would like to upgrade their equipment to the higher performance of SDR technology on a budget. The 6400M for $2999 adds the built in display and knobs. The 6400M is ideal for users who would rather not base their operations on a computer dependent platform. The 6400M gives the user the option of standalone operation or computer tethered operation with SmartSDR. The 6400M is fairly comparable to the $3500 Icom 7610 but with a much larger feature set than the Icom competitor and is the best bang for the buck between the two. The 6400M will probably be Flex Radio’s “sweet spot” in the new line up. Users with more advanced needs like SO2R may be drawn to the more capable $3999 6600 or the $4999 6600M models. The new Flex 6000 series radios are starting to slowly trickle out to users. HRS was able to get one a few weeks ago and been getting familiar. So far impressions have been very favorable at this point. In the upcoming weeks there will be an HRS User Review posted on the site, but in the meantime here is a short video of the 6400M in action.